Nuru places an immense amount of value on being open and transparent about the learning’s and experiences that happen while fighting extreme poverty and innovating to develop viable social enterprises on the ground in Kenya. Part of being an innovator and a pioneer means that occasionally things are going to work out, but the real success comes in how you learn and change based on things that didn’t work. The chilies agribusiness project provides Nuru and the greater development community with a valuable learning opportunity. The chilies agribusiness pilot was developed in partnership with MACE foods and had initial targets and projections to reach 500 farmers in the first pilot year with each farmer harvesting an average of 600 KGs in the first year. Due to the confidence Nuru had in MACE and in the farmers, a contract was signed with a penalty clause that would come into effect in the event that Nuru failed to deliver 70 metric tons of chilies to MACE by the end of May. The challenges in the chili pilot started in the beginning with slower farmer recruitment than anticipated, and continued with a tobacco disease that spread to the chilies crops which resulted in 12% of total crop loss followed by drought that delayed planting time and affected key project deadlines. These challenges were compounded by underestimating the difficulties in the labor process for harvesting chilies that led to setting a buying price that was not motivational for farmers. All of these factors resulted in drastically lower than anticipated volumes, which meant Nuru was unable to fulfill the terms of the contract, and had to pay a penalty to MACE. This pilot had many tough challenges, but with those challenges came five hard learned invaluable lessons that the Nuru staff will carry into further enterprises and ultimately make the team and organization even stronger. Before entering into any business line, due to the challenges of operating in the rural Kenya environment in particular, there needs to be rigorous testing of the assumptions. In the case of the chilies business, Nuru used data of other large chili growing operations to make assumptions for the financial model mainly due to the time constraints of the growing season and long plant cycles. A test plot would have allowed testing the assumptions such as time required to harvest chilies, anticipated volume per acre, and required farmer labor per kilogram harvested. In the future, this is an essential step to make sure the outside data is actually viable here on the ground in Kuria West. Fundamentally Nuru is an organization made up of incredibly hardworking people who are used to succeeding in what they set out to do and overcoming many challenges in the process. The concept of failure isn’t something that Nuru people spend a lot of time thinking about, but in signing contracts it is important to make sure that the organization is protected in case something goes wrong and can’t be fixed within the required timeline. The contract signed with MACE foods included a penalty clause for non-delivery. In the future especially in the case of a new business these types of clauses are to be avoided. Cash crops are a secondary priority for the majority of farmers who focus first on growing sufficient food to feed their families. Recognizing that piece of information and planning around the food crop planting and harvest season are crucial to a successful cash crop business. It is also important to note that the labor force on the farms is limited to family members with often very short time windows to both plant, maintain and harvest so the volume expectations need to reasonable as cash crops will most likely get less attention. These differences require a clear separation in the agriculture program and agribusiness as they have specific goals and challenges that necessitate different operational and program structures, different payment models for farmers, and overall a unique approach for each unit to be successful. As the chilies pilot was a new business line, Nuru did not have in-house knowledge about production and operation of a successful chili farm. Each crop is very specialized requiring unique cultivation and harvest methods; knowledge in a certain areas of crops may not translate to others. 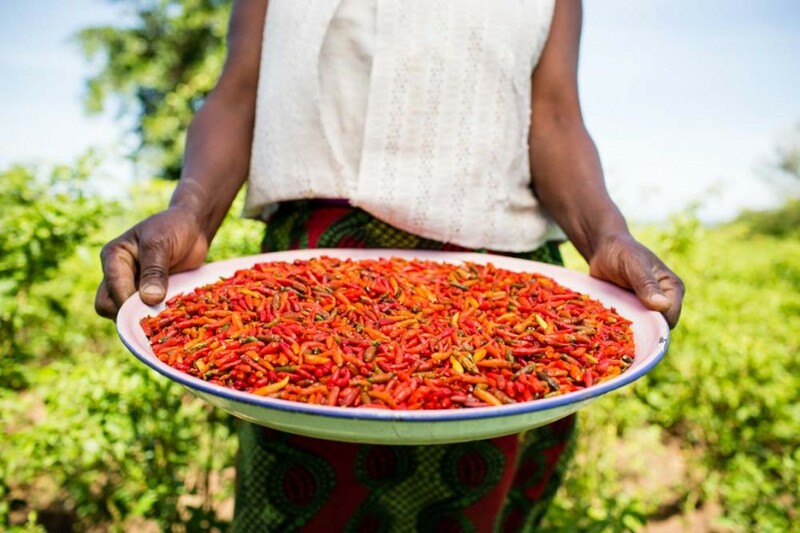 Without in house knowledge about chilies, Nuru was in the position of relying on MACE foods for information and experience, which can result in conflicting interests. Future new business lines will engage knowledgeable independent professionals and invest more time and resources in the research and development phase of the project to build a staff that have the experience and knowledge to deal with challenges that may arise. This lesson has already impacted Nuru Social Enterprises hiring practices and for the upcoming dairy business led to the careful recruitment and selection of Godfrey Otieno, a dairy expert, who has over 27 years of experience in the dairy industry establishing successful dairy businesses in both Kenya and Malawi. Every business has risks, whether it is being built on the ground in western Kenya or started out of a garage in California. The important thing is to look at the worse case scenario from the outset and create a strategy to both never get there and also a plan for if it happens. Due to the uncertain political and environmental factors in Kenya this type of risk mitigation is even more crucial, because the reality is challenges will come up. This is where the risk mitigation strategy comes into play. A venture that is aware of those challenges from the outset and ready to face them head on, can effectively maneuver over and around them, while enterprises that haven’t done that strategic planning will likely flat line. In the case of the chilies pilot, risk mitigation could have involved a strategy of risk transference to a third party such as building crop insurance into the model or risk limitation through building in loss limiting protection clauses during the contract negotiation process. Nuru Social Enterprises (NSE) is a for-profit subsidiary of Nuru International, a social venture with a mission to end extreme poverty in remote, rural areas.